As the doors open for Monaco Yacht Show 2016, FunAir officially launch their next generation inflatable yacht toys to the world’s most passionate superyacht clientele. The incredible Joust is like nothing we have seen before. A stable, non-slip challenge platform is suspended a full 1.5 metres above the water, giving owners and guests a true bridge to enjoy family friendly jousting tournaments. Each Joust comes with two light weight batons with easy grip handles and are suitable for children and adults a like. 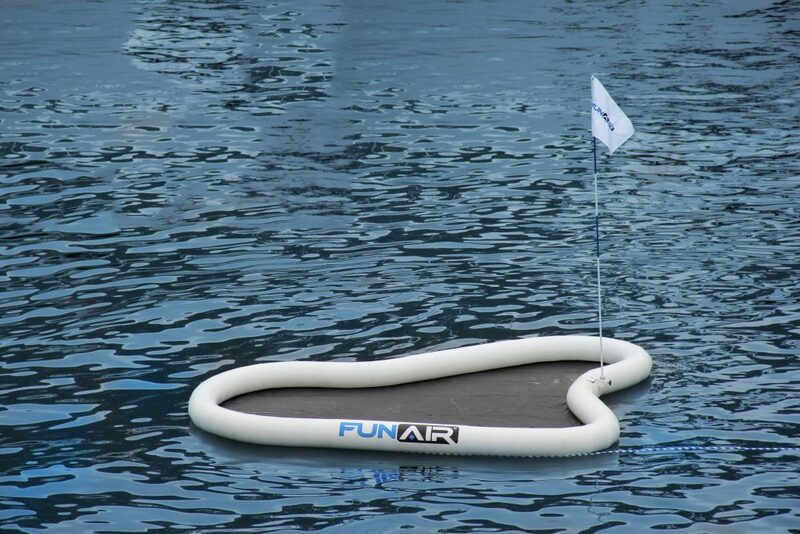 FunAir has been carefully developing Yacht Golf over the last year and have designed and built a flexible and realistic multi green system to please even the most keen golfers. Each green can be set out at different distances and has a genuine golf pole to mark each hole. Available in sets of three, you can create your own 9, or 18 hole course whilst out at sea with tough netting on each green to catch the balls. Known for making memories and inflatable yacht products, FunAir will be the only company to have inflatables in the water at MYS and are once again official partners of the Captains and Crew Lounge. 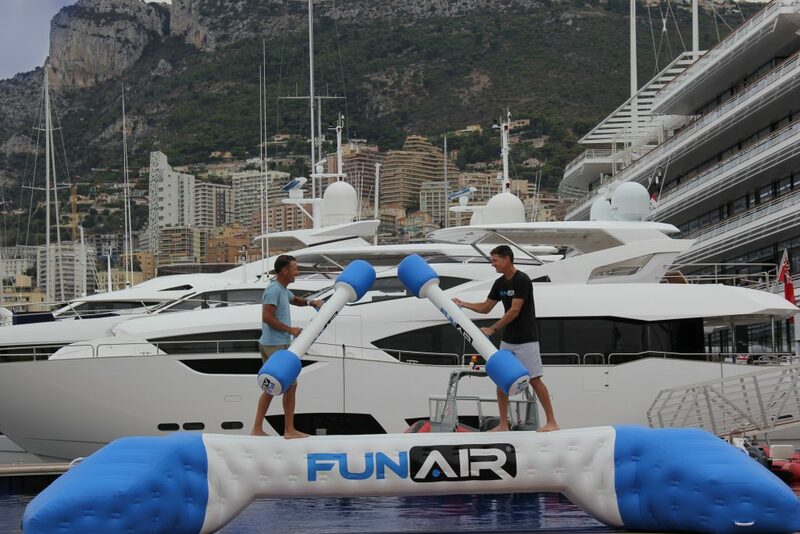 FunAir’s Managing Director of Yachting, John Courtney, said “We have a great on-water space to display the Yacht Golf and Joust right outside the Monaco Yacht Club at the Captains and Crew Lounge. This exciting news comes on the back of FunAir’s new website with the first click and buy interface for inflatable yacht products. Showcasing both quick-ship and custom inflatable products for yachts, resorts and at home family fun, the site offers online shopping and promises to quick-ship available products within 24 hours. Products currently available for quick-ship delivery include, Yacht Slides, Climbing Walls, Personal Watercraft Docks, Water Mats, Stand Up Paddle Boards, and the Glacier Extreme. With distribution centers in Europe, America, Australia and the East, FunAir can ship out the quick ship products in just 72 hours to captains and owners across the globe. Find the FunAir team in the Captain and Crew Lounge at this year’s Monaco Yacht Show, on Quai Louis II next to the Monaco Yacht Club. The Captain and Crew Lounge will be open each day from 8:30am until 7:00pm. 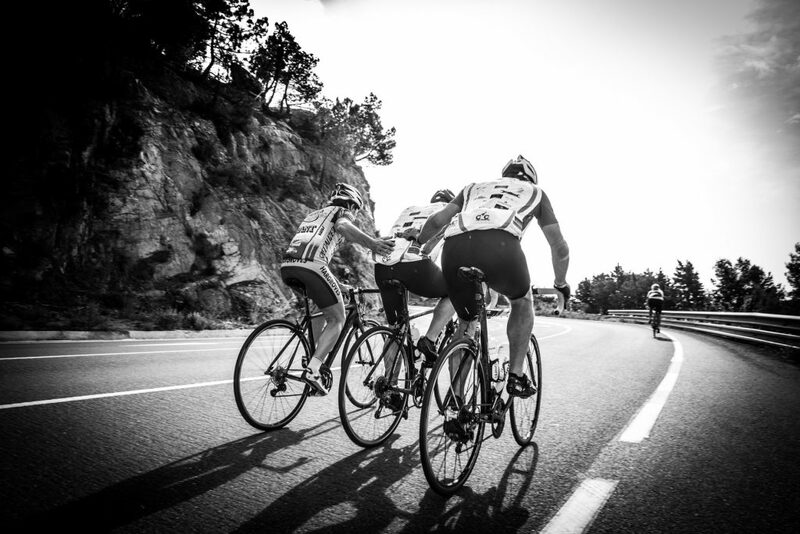 In October 2017 36 keen amateur cyclists who all work in the superyacht industry will leave Cancer Research UK head quarters in London to ride approximately 1400km over 10 days to Antibes, France in aid of raising funds for both CRUK and local French cancer charities. 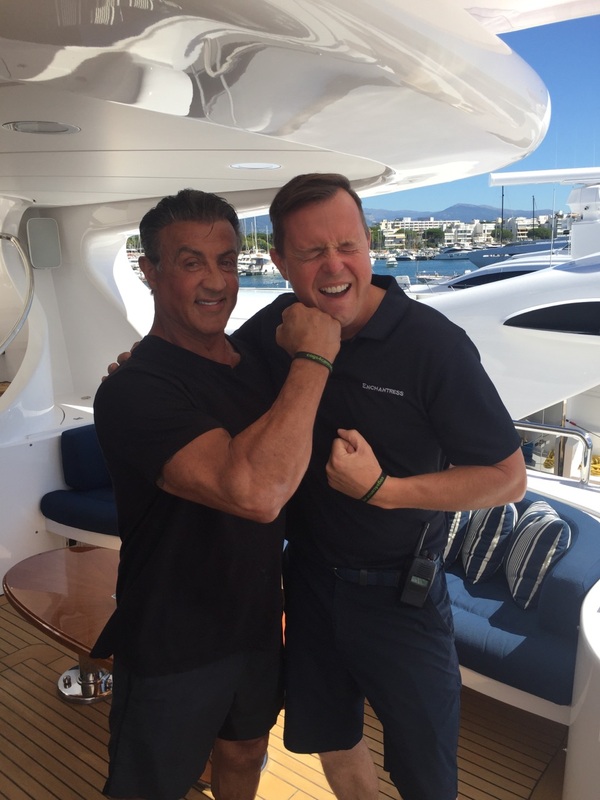 Mr Sylvester Stallone and Captain Simon MacKay from M/Y Enchantress became the first supporters for the 2017 Cogs4Cancer ride, when the Rocky star was happy to pose with a C4C supporter band for the charity whilst on board a luxury yacht a few weeks ago. This is the 4th ride organized by Cogs4Cancer and the yachting community with the previous three rides having raised over 700,000 euros. It is hoped they can smash the 1 million euro mark this time around with the charities longest endurance ride yet. Join in by buying a supporter band yourself at this years Monaco Yacht Show, donate online at www.justgiving.com/cogs4cancer or sponsor one of our riders or stages. It’s your opportunity to get involved and help give something back. Leading yacht inflatables company FunAir will be launching two brand new products at the 2016 Monaco Yacht Show (MYS). Yacht Golf and their unique new Jousting product will be revealed on the first day of the show when the full details are officially announced. FunAir’s Managing Director of Yachting, John Courtney, said the Captain and Crew Lounge is the meeting place during the four-day show, which makes it the perfect environment in which team FunAir can engage in more relaxed conversations. “Last year we found that captains and crew welcomed the chance to take time out to chat with us and of course sample some fun!” said John. “Being the only inflatable company with an in-water display right outside the Monaco Yacht Club, we will launch our Yacht Golf and Joust right alongside the world’s most beautiful yachts. This exciting news comes on the back of FunAir’s newly launched website with the first click and buy interface for inflatable yacht products. Showcasing both quick-ship and custom inflatable products for yachts, resorts and at home family fun, the site offers online shopping and promises to quick-ship available products within 24 hours. Products currently available for quick-ship delivery include, slides, climbing walls, personal watercraft docks, Water Mats, Stand Up Paddle Boards, and the Glacier Extreme. The must have Super Sweet Slide and GaGa Ball pit are also available with immediate shipment for unparalleled on land fun. With distribution centres in Europe, America, Australia and the East, FunAir can ship out the quick ship products in just 72 hours to captains and owners across the globe. Find the FunAir team in the Captain and Crew Lounge at this year’s Monaco Yacht Show, on Quai Louis II right next to the Monaco Yacht Club. Since the first endurance cycling challenge in 2013, Cogs 4 Cancer has raised over 700,000 euros for cancer projects all over Europe. With the million Euro marker now in sight, the team decided to ‘go big or go home’ for the next ride and will be announcing the 2017 program in just a few weeks. Ben Young, President of Cogs for Cancer explained, “We organized three 800+ KM rides in three consecutive years and after the huge success of the 2015 event we didn’t want to keep knocking year after year on the doors of our very generous supporters therefore decided to take a year off. “We wanted to make sure sponsors and supporters kept their interest in what we are doing, and also ensure that the ride stays interesting for the many repeat riders we have who have taken part in all three challenges so far. Cogs 4 Cancer is managed by a group of volunteers who all work within the superyacht industry. 100% of all money raised goes to the designated cancer charities across Europe and the UK and the volunteers not only put in countless hours planning, preparing and promoting, but also pay for all their own travel and equipment needed to make the 800+ KM cycle rides happen. The charity is inspired by the story of those within the yachting industry who have been touched by cancer in one-way or another. Well loved yacht professional and cycling enthusiast Adrian Long was diagnosed with cancer in March 2012 and within the year a group of likeminded personalities came together to form the charity with the ethos that every single penny raised goes directly to cancer research, and all other operational costs are covered by the riders and support team themselves. The riders share a common goal to help enable the fight against cancer. 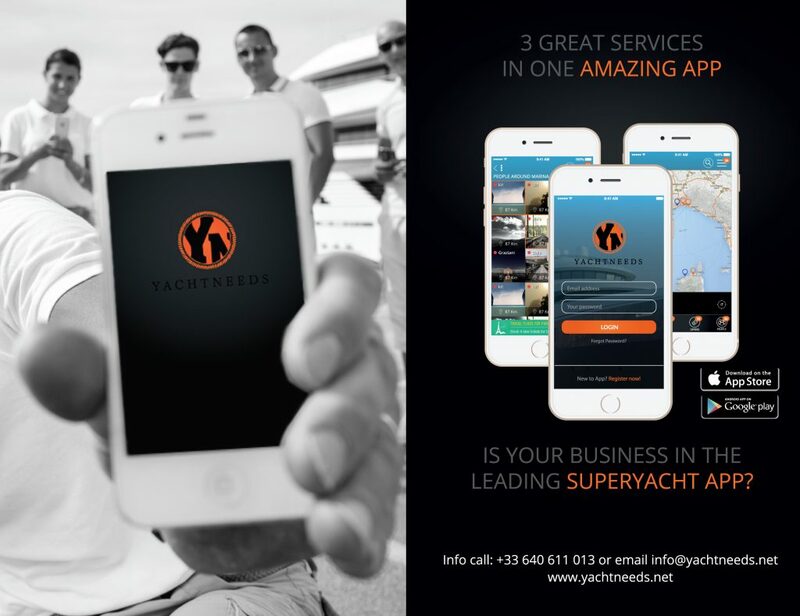 Each rider has their own personal drive as well as riding together for the numerous people that the superyacht Industry has sadly lost to this terrible disease. A grand total of 705 080 € has been raised so far and by December 2013, Cogs 4 Cancer was ranked within the top 1% of all fundraisers on the JustGiving charity fundraising website. Team FunAir are busy making plans to be at this year’s Cannes Yachting Festival and would love to hear from captains and owners who will be at the first boat show of the season. FunAir loves Cannes Yachting Festival for many reasons, the host of yachts on display, the chance to catch up with people in such a stunning location, finding out about everything new in the industry and of course meeting new clients and getting feedback on the company’s innovative inflatable yacht products. On the heels of a busy & successful first half year, product launches and a new website, FunAir has plans to unveil even more exciting ‘firsts’ very soon. 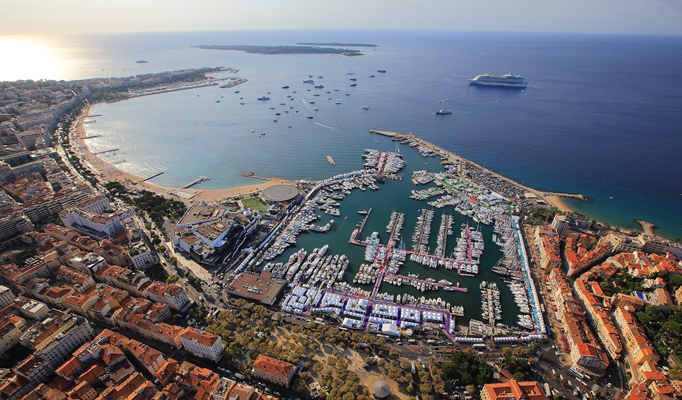 But for now, Managing Director of Yachting, John Courtney, Managing Director of Yachting & Marine, will be in Cannes for the festival to meet up with people and enjoy the atmosphere. John says the festival is the perfect opportunity for businesses, captains, crew, owners and owner representatives to get together and brainstorm. “Cannes is a superb destination as well as an amazing yacht show. I love that I have time at Cannes to feel part of the lifestyle, to take lunch with my peers, my clients and great people I may have just met that day at the show. “I am really looking forward to the new luxury area: La Terrasse and exploring everything the industry has to offer. “We are known for making extremely high quality, fun-filled inflatable yacht products, which is fantastic,” said John. 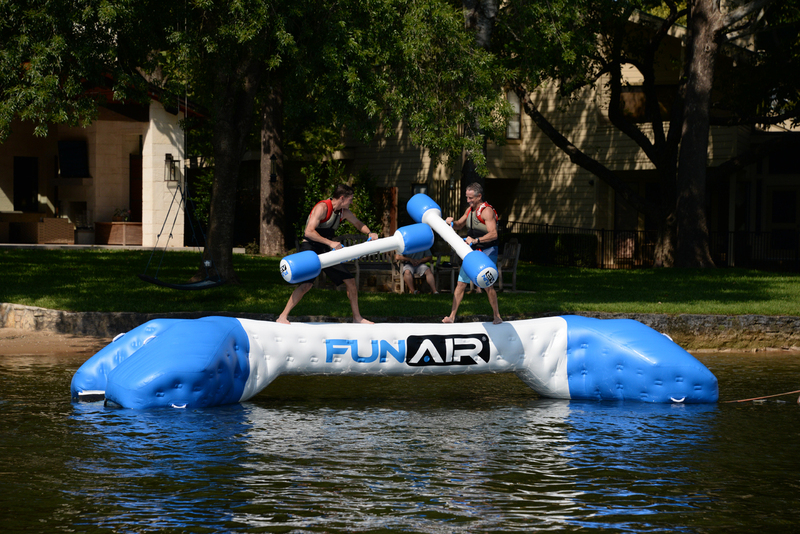 The FunAir team has built hundreds of custom inflatable toys for yachts, including multiple types of yacht slides. 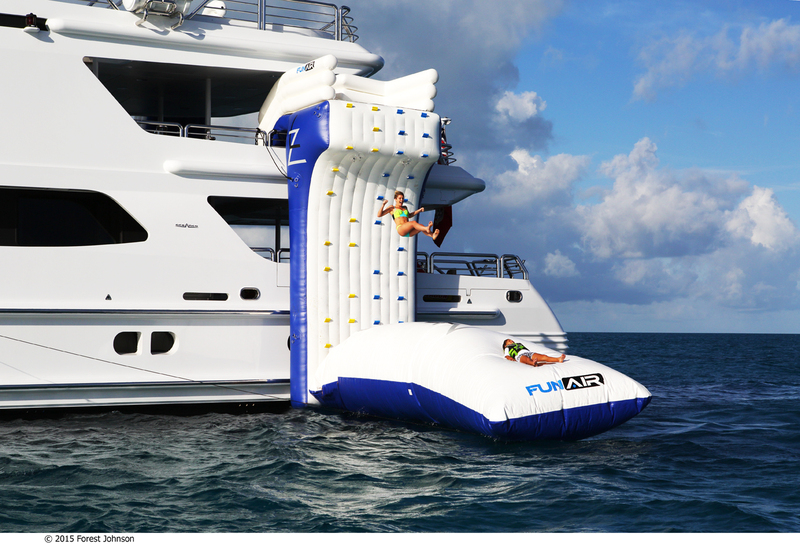 In just four years, FunAir has already built the tallest inflatable climbing wall, significantly reduced deployment times for large inflatable products with their patented RapidFlate technology, launched the first in-stock yacht slide that can be shipped within 24 hours; and developed the first innovation partnership to test and develop new inflatable products with popular charter yacht Lazy Z. In another ‘first’, the FunAir team recently launched a brand new website with the first click and buy interface for inflatable products. Showcasing both their quick-ship and custom inflatable products for yachts, resorts and at-home family fun, the site offers online shopping and promises to ship products within 24 hours. Products currently available for quick-ship delivery include yacht slides, climbing walls, personal watercraft docks, stand up paddleboards and Water Mats. The must have Super Sweet Slide and GaGa Ball pit are also available with immediate shipment for unparalleled on land fun. To arrange a time to see John at this year’s Cannes Yachting Festival, running from 6 to 11 September, email yachting@funair.com or call +1 512-593-5133.